A new page will be posted for the 2020 trip closer to the dates of the trip, but much of this trip agreement will remain the same. 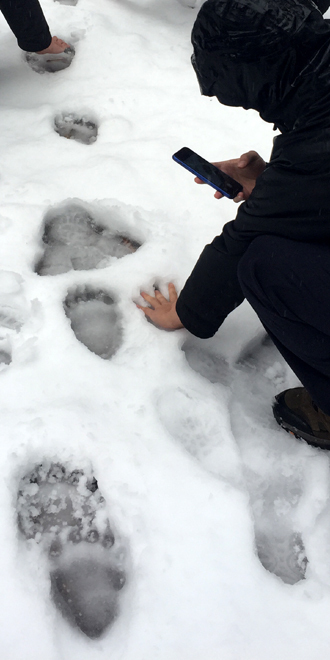 To go on the De Anza College Outdoor Club Yosemite Feb. 1-3, 2019 winter trip, you (and a parent / guardian if you are under 18) will need to agree to all the following, some of which might be new to you even if you went camping in the winter before or went on this trip before. Signing up will go much faster if you read this carefully in advance of coming to sign up for the trip. Do not print and sign this page, there are other parts to fill out / initial on the official trip agreement. Please note that the document might change before you sign it AND additional trip rules might need to be made during the trip. You must agree to all these rules. If you don’t want to abide by any of the rules, then (yup, you guessed it) don’t sign up for this trip. Camped in steady, heavy rain for hours y / n ? Been on this trip with us before? Circle y / n If yes, how many years? Been on an event with the Outdoor Club? Circle Y / N, if yes, which event/year? The event begins and ends at Yosemite. De Anza/Foothill district, and therefore the club, does not arrange carpools, so people signed up for the trip will arrange their own transportation and pay for their own gas. I will drive, but I will be making my own plans and do not want to give rides. I will (choose one) – come to Yosemite National park for the day _____ camp in the park _____ stay overnight at Half Dome village in (describe type of overnight accommodation) _____________________ stay at a Yosemite overnight accommodation not in Half Dome Village (describe) _____________________________. I understand and accept that for good and sufficient reasons the Foothill De Anza Community College District is not providing transportation for the field trip described above. As a consequence, I will be responsible for my own transportation whether as an individual or cooperatively with other students. I will in no respect rely on the instructor or other District employees for direction or supervision of my transportation. Print name (your name) has read and agreed to all the pages about the trip at the Website: marydonahue.org and the things below for the Outdoor Club Yosemite winter trip. When you (or your parent/guardian) fill out the actual form, in person, you will put your initials, not an “X”, in the space after each statement/paragraph to agree to the terms of this trip. Before I offer/promise rides to people I will be sure the vehicle runs reliably, be sure chains can fit on the wheels, make arrangements for snow chains, get permission of anyone I need to borrow the vehicle from, get permission to drive in the snow from anyone who would need to give permission AND get time off from work . I will have the courtesy to let my driver/ passengers/the Outdoor Club know immediately of changes to my ride needs or ability to drive. If I park at the campground I will turn off my car alarm. I will disable the loud beep that goes off when the keyless remote is used to unlock the car OR I will take the remote off the keychain and use the key to unlock the door(s). I will disable the beep that goes off when the trunk is opened / any other beep. In the interests of letting others sleep, if I can’t disable the beep(s) (or disconnect the beepers) I will not drive that vehicle or I will park it at a day use parking lot. If I rent a vehicle I will learn how to turn off car alarms/disable beeps at the rental business, BEFORE I leave for the trip. If I camp I will bring at least one full length insulating sleeping pad and not just sleep on an air mattress, a blanket or the ground. I will bring a dome-shaped tent with a full rain fly that goes all the way down the sides and I will pitch it with the rain fly on even if the weather looks good. I will not share my campsite with anyone except students on the trip. If I use a dining canopy and there is any chance of snow I will take it down (if I am not under it shaking snow off) so it won’t collapse and possibly get damaged or damage a tent or person under it. I will follow all National Park, trip and De Anza rules. Since the Rangers can impound my car/food or fine me if I don’t follow food storage rules, I will be responsible for fines, (the college/club will not pay the fine which can even be more than $5,000). I will keep all food and toiletries in the food storage locker except when I am actually using them. The park service says food farther than arms length is too far away and behind the back is an invitation (to animals), so I will sit (or have a partner sit) within arms reach of all food I bring out. I will shut and latch the door to the food storage box immediately after moving anything in or out. If I drive or ride in a truck I will be certain someone stays in the back of the truck to guard gear from raccoons until it is all unloaded and dealt with. I will make sure the doors are shut on my vehicle as each item is unloaded so raccoons don’t get in. I will make sure the vehicle is completely clean of my and others trash, food/toiletries at all times. No daypacks or containers that are shaped like food containers, even empty water bottles, will show through the windows of my vehicle/the vehicle I ride up in. I will limit the amount of food, toiletries, and cooking gear to what will fit in my share of a campsite or tent cabin food storage locker. I will not padlock the food locker if I am sharing one. At bedtime I will triple-check my day pack, jacket and pants pockets for candy bars, chips, flavored chapstick or anything else that could attract animals into my tent, tent cabin or car. When I pack I will not mix food in with other gear. Since styrofoam ice chests and drinking cups can break up in to bazillions of pieces that can’t be cleaned up, I will not bring anything styrofoam . I will bring a telephoto that is big enough for the photos I want and not endanger myself or others by trying to get close to animals for pictures. I will not photograph or videotape (includes using a GoPro) anyone on the trip without their permission. If I do not want to be in a group photo I will stand apart from the group while it is being taken. USE OF MY LIKENESS: I understand that during the trip the club advisor may photograph or videotape me. To the fullest extent allowed by law, I waive all rights of publicity or privacy or pre-approval that I have for any such likeness of me or use of my name in connection with such likeness, and I grant to De Anza College, the outdoor club and the faculty advisor and assigns permission to copyright, use, and publish (including by electronic means) such likeness of me, whether in whole or part, in any form, without restrictions, and for any purpose. I will bring everything on the list of required gear at the Snow or rain camp must-haves website page. I will not wear cotton socks. I will have waterproof rain jacket / pants and a flashlight or headlamp (not just my cell phone) with me at all times. I will not use alcohol or mind altering substances on the trip and I understand this is an enforceable rule even for people over 21. I further understand that use of alcohol in the cold is especially dangerous. I realize that medical/recreational Marijuana is illegal in a national park, even if it is legal in the state the park is located in. I will not bring any firearms or tazers even though they may be legal in Yosemite. I will not bring pets. I will not use a drone (quadcopter, etc. ), since they are illegal in the park. I will go to a Ranger station and check about the trail I want to hike the morning of the hike . If I hike above the valley floor or ski away from the free groomed cross country trails at Badger Pass, I will do so in a group of minimum four people so if something happens to one of us there is someone to stay with the injured/ill person while two others go for help .If I hike above the valley floor I will stay on the trail(s), with this possible exception: if I want to get a closer view of the snowcone at the base of upper Yosemite Falls I will go off trail only a maximum of 15 feet, in a group of four or more people and stay in the top of the boulders high above Yosemite Creek near the trail. (And therefore not get close to the snowcone or the frozen creek area and risk losing my footing and sliding off the edge to my death). If I hike to Mirror Lake I will not hike above the valley floor, beyond the regular trails and into Tenaya Canyon, which is extremely dangerous even in the summer. I will not try a summit hike (including Half Dome) or off-trail hike or camp anywhere that a wilderness permit is required. On any hike I will obey trail-closure or warning signage, closed gates, barrier fences and/or advice from Rangers that I not use any trail. – – a 7 a.m. (yup, at sunrise) Saturday morning (probably coffee/hot chocolate, snacks), plans-for-the-day-meeting, (why 7 a.m.?? because the free bus to the ski resort / ranger snow shoe walk leaves at 8 a.m. from very near the Half Dome Village lounge, about a block away from the campground, and the longest hike takes all day, so people need to get moving early). 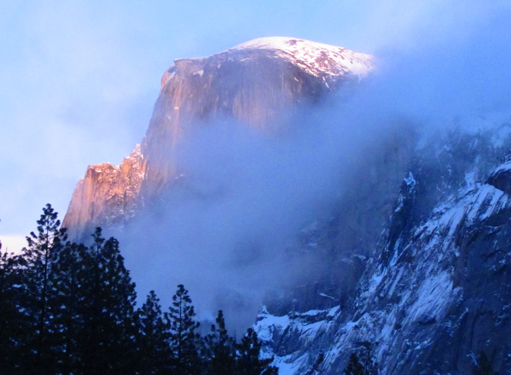 The 7 a.m. meeting, (likely to be at the Half Dome Village lounge) may be the time most people finally decide what they are doing on Saturday. 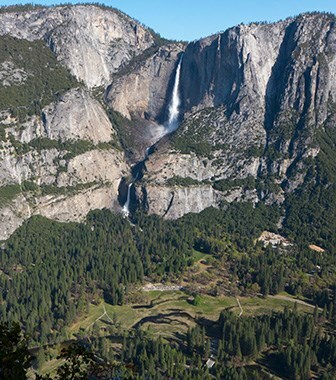 A possible club activity might be a tour of Yosemite Valley on the free shuttle bus with the club advisor Saturday morning after the plans-for-the-day-meeting. Another official club activity will be optional brunch Sunday after people pack up. All other activities, including sightseeing, skating, hikes (including a walk/hike or snowshoe walk with a ranger), photo walk with a professional photographer which you are advised to sign up for in advance, rollerblading, biking, climbing, skiing, sledding or snowboarding are not club events. I will wear a helmet for climbing, biking, sledding or rollerblading even if I am over 17. I will not put on perfume/cologne before brunch – people sitting near to me at brunch may have allergies. I will not wear dirty camping clothes to brunch. I will instead plan to get a free shower and put on clean Friday casual type clothes, or even a dress for ladies or a jacket/vest/tie for men. Since noise is the first thing people complain to Rangers about (plus, out of consideration to trip members who would like to listen to Mom nature’s sound), I will bring personal headset radios/tapes, and turn my car stereo off before I enter the campground or Half Dome Village. In the campground, but not at the tent cabins, acoustic guitars are encouraged, (drums, tubas etc. are not allowed). If I want to get someone’s attention in another campsite, I will go there and talk to them, not yell long distance. I won’t walk through other people’s campsites to get to the restroom, to the bus, to another of our sites. I will not get into my vehicle at night and run the engine to warm up (thereby waking up everyone in the vicinity and possibly running down the battery so the car won’t start later). 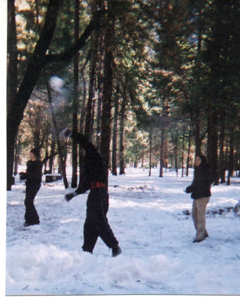 I will have snowball fights in a vacant part of the campground, not in my campsite or near other people. I will try to think safety, including packing the snowballs loosely with no rocks, not aiming for faces and only play with people who want to. I understand the need to follow campground and Half Dome village quiet hours rules. I understand that it is impossible to keep a big group of people around a campfire quiet late at night. I know that the De Anza group got a warning from a Ranger to pack it in and be quiet in 2002 or be evicted from the campsite and the park because of this. I know that another group in the campground was kicked out of the park that night because of noise. I will start being fairly quiet at 8 p.m., two hours before the quiet hour. I will cheerfully help put out the campfire at 9:50 p.m. and if I want to stay up past 10 p.m. go on a night hike (and return from the hike whispering at the most). Since voices can be amplified in the restrooms, if I am too wet and/or cold, I will hang out in my tent, the cafeteria or the laundromat, not in the restrooms. I will not bring cut up lumber/logs/branches type firewood from home. I will be responsible for staying next to any campfire I start or finding someone else to do so if I leave the fire ring area. I will tie back my long hair when working around a campfire/stove. If I am roasting marshmallows and one catches fire I will not wave it in the air to put the flames out. Interesting weather does not cancel club events. ***NO REFUNDS, except if the club cancels the trip before the trip starts ***. If I sign up for this trip before winter quarter and it turns out that I am not a student winter quarter (and/or I am not a DASB card holder) and therefore can’t go on the trip, OR If I pay for the trip before doing paperwork and then do not get the paperwork done and in the hands of the faculty advisor before the trip, I realize I will not get a refund and I will not just show up in Yosemite and try to participate. I agree that due to the large number of people expected to sign up for this trip, the club may not be able to call/email or contact anyone if there are changes and I might even arrive in Yosemite National Park before I learn that part or all of the trip has been cancelled. I will get time off work or whatever is necessary to be able to attend the MANDATORY pre-trip meeting at noon, Saturday, January 26 at the pool deck. This will be the time for last minute announcements, and a good time to have your tent, boots, or clothes looked at, to consult about food or other plans. Last minute carpools and shared overnight accommodations are often arranged then. The club will provide: a first aid kit and possibly a water purifying pump for trip member hikes. Trip participants are responsible for any other gear, including tent, sleeping bag/pad, and other personal gear, and all other expenses including food, gas, skiing and brunch. Where I stay overnight (campground, tent cabin, cabin or hotel room) will be up to me (or I could come up just for the day Saturday – but people rarely do). Since there will be no overnight supervision by the college, parents/guardians of under 18 year old students are expected to be at their overnight accommodation. If parents/guardians also want to participate in official club activities, they can take a De Anza class, such as an online class. The trip is open only to De Anza students. Therefore, people signing up will not try to pass off a friend as a student or tell friends to get their own campsite to get around club rules. I acknowledge that I can read this contract at the website: marydonahue.org and will not get a hardcopy of it. I will follow the rule that campsites, activity areas and all park restrooms, stores, restaurants, etc. and anywhere that smoke might drift into where people are, are non-smoking. I realize that I can get kicked off the trip if I break any trip, park, club or college rules (and/or if law/rule breaking by others causes the club advisor to cancel the trip) and I will not get a refund. The Park Rangers could make me pack up and leave the park even in the middle of the night, depending on what I did/what happened. Using tobacco products anywhere the park says you can’t or that others must smell/breathe the fumes. If any trip participant is pregnant they must provide a note from their doctor, on the doctor’s letterhead, stating that it is completely safe for her and the baby(ies) to participate. If any trip participant has a serious condition, such as a heart condition, asthma/significant allergies they must provide a note from their doctor, on the doctor’s letterhead, stating that it is completely safe for them to participate. If any trip participant has a serious condition, such as anything that does not allow them to get a driver’s license, a bipolar disorder/anxiety disorder, substance abuse, eating disorders, chemical dependencies, chronic juvenile offenses, a history of violent behavior, suicide attempts, or the like the Outdoor Club needs to know this at least three weeks in advance of any event, so as to seek, where appropriate, a doctor’s assurance that the participant can safely participate and has possession and knowledge of use of necessary medications, and to be sure that the trip members are prepared to deal with special needs, failing which the person may have to be refused participation (subject to Americans With Disabilities Act issues, worked out in advance with De Anza Disabilities Support Programs and Services (DSPS) counselors ). I am saying that this does not apply to me _______ OR I am saying that I have _______________ condition or that I am _____ months pregnant. • Family history of heart disease (family member who’s had a heart attack at less than 50 years of age). 1. Are over 25 years old and have 2 of the above cardiac risk factors. 2. Are over 40 years old and have 1 cardiac risk factor or anyone of any age who leads a sedentary lifestyle. 4. Are any age with known coronary artery disease. 5. Completed a cardiac scan and has a calcium score greater than 10. 6. Are over the age of 60. If this applies to me (circle any/all that do) I will provide a written note from my doctor stating the date of the stress ECG and the results and the statement from the doctor(s) that I can participate in the trip. Waiver: In consideration of being permitted to participate in any way in the field trip hereinafter called the Outdoor Club winter Yosemite trip / optional brunch, I, for myself, my heirs, personal representative or assigns, do hereby release, hold harmless, waive, discharge, and covenant not to sue Foothill-De Anza Community College District, its Board of Trustees, the individual members thereof, all District officers, employees, volunteers and servants from liability from any and all claims including the negligence of Foothill-De Anza Community College District, its Board of Trustees, the individual members thereof, all District officers, employees, volunteers and servants resulting in personal injury, accidents, or illnesses (including death) and property loss arising from, but not limited to my participation on the Outdoor Club winter Yosemite trip / optional brunch I certify that I am fully capable of participating in this activity. Indemnification and Hold Harmless: I agree to INDEMNIFY AND HOLD Foothill-De Anza Community College District, its Board of Trustees, the individual members thereof, all District officers, employees, volunteers and servants HARMLESS from any and all claims, actions, suits, procedures, costs, expenses, damages and liabilities, including attorney’s fees brought as a result of my involvement in the Outdoor Club winter Yosemite trip / optional brunch and to reimburse them for any such expenses incurred. 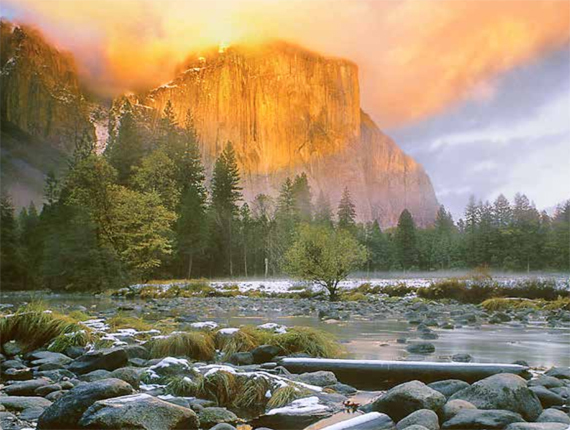 Assumption of Risks: Participation in the Yosemite winter Yosemite trip / optional brunch, carries with it many risks which can not be eliminated or even minimalized, even with trip rules and protocols, regardless of the care taken to avoid injuries. 12) catastrophic injuries including drowning, loss of limbs, paralysis, permanent trauma and death. I have read the previous paragraphs and I know, understand, and appreciate these and other risks that are not specifically identified that are inherent in the Outdoor Club winter Yosemite trip / optional brunch. I hereby assert that my participation is voluntary and that I knowingly assume all such risks including significant ones, which cannot be prevented. risks agreement is intended to be as broad and inclusive as is permitted by the law of the State of California and that if any portion thereof is held invalid, it is agreed that the balance shall, notwithstanding, continue in full legal force and effect. By signing up for this trip you are agreed to all of this and know you can be kicked off the trip without a refund if you do not follow trip rules or are in defiance of the faculty advisor and can expect to be reported to the college. I have read the above trip agreement and understand its terms. I execute it voluntarily and with full knowledge of its significance. I have no questions or have had any questions about the trip or trip rules answered. 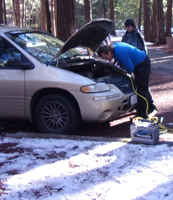 For info on the logistics of where to pitch your tent, dealing with iced car door locks, staying warm and comfy overnight and more, go to: First-timer’s instructions Yes, a lot of this applies to people who will stay at a hotel instead of the campground. Snow camp carpools and driving directions. Did you read Safe driving in rain and fog ? Road trip advice and etiquette has links to radio station guides and gasoline prices across the country. You can take a short walk to the view below, or hike all the way to the top of this waterfall, one of the tallest in the world. 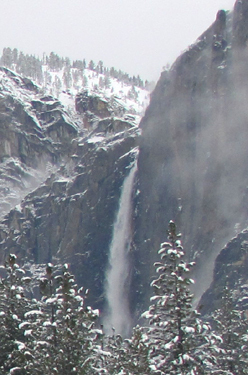 This view of Yosemite Falls in February is from the far left hand portion of the lower Yosemite Falls walkways/trails. 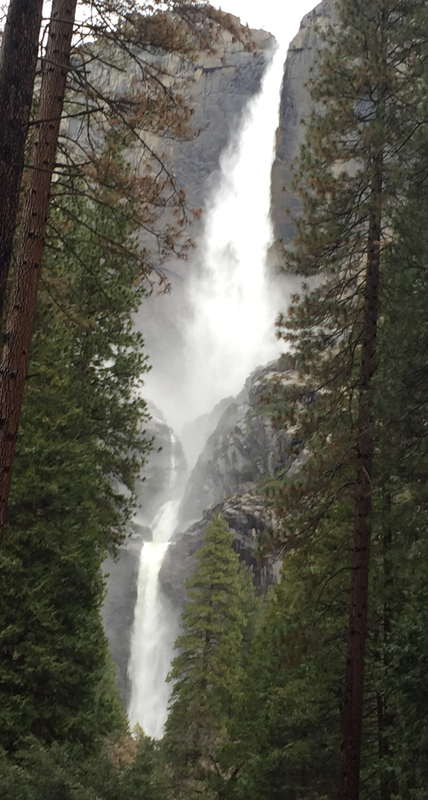 Read about the hike to the top at Upper Yosemite Fall hike.